We’d love your help. Let us know what’s wrong with this preview of Jeremiah's Hunger by Elizabeth Osta. When Jeremiah Buckley buries his baby sister and his mother in a hillside in County Cork in the midst of An Gorta Mor,(the Great Hunger), his grief turns to rebellion and commitment to the land as he works to achieve a dream which will echo over the centuries and as far away as America. Jeremiah's journey carries him into the bare heart of his homeland where he endures the When Jeremiah Buckley buries his baby sister and his mother in a hillside in County Cork in the midst of An Gorta Mor,(the Great Hunger), his grief turns to rebellion and commitment to the land as he works to achieve a dream which will echo over the centuries and as far away as America. To ask other readers questions about Jeremiah's Hunger, please sign up. In the 1840s the potato famine ravaged Ireland. Crop failures, starvation, and emigration to America reduced the population of the country up to 25%, but Ireland was troubled even before then. Until 1828 Irish Catholics had been barred from owning land. When the blight struck, most of them were still renting small farms from English landlords. If the starving families couldn’t pay their rent, they were evicted. Jeremiah Buckley came into manhood during this bitter time, and watched family and fri In the 1840s the potato famine ravaged Ireland. Crop failures, starvation, and emigration to America reduced the population of the country up to 25%, but Ireland was troubled even before then. Until 1828 Irish Catholics had been barred from owning land. When the blight struck, most of them were still renting small farms from English landlords. If the starving families couldn’t pay their rent, they were evicted. Jeremiah Buckley came into manhood during this bitter time, and watched family and friends die or cross the ocean forever. His physical hunger was eased through hard work and wise farming, but his soul craved the day that his beloved Ireland would be freed from oppressive English laws. 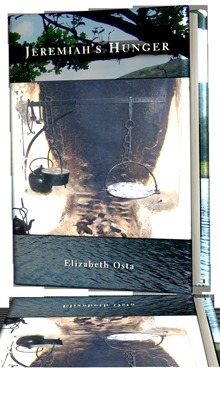 "Jeremiah’s Hunger," a 2011 historical novel by Elizabeth Osta, explores the aftermath of the Great Famine. When Jeremiah flirts with Irish nationalism the violent tactics of the Fenians repel him, but the brutal suppression of rebellion brings even greater horror. He finally finds peace in a quest to own his farm. Ms. Osta taps family history for "Jeremiah’s Hunger," for Jeremiah is her great-grandfather. She weaves a moving tale of her family’s struggles, and Osta’s vivid descriptions of Ireland and its people are often breathtaking. However, interweaving the Buckleys’ story with that of Jeremiah’s inlaws who emigrated to America, with its large cast of characters and frequent changes of venue, was sometimes distracting. "Jeremiah’s Hunger" comes to a lovely close when Osta’s grandmother comes to the fore as she prepares to leave home for America. I hope Ms. Osta continues to write about Maggie Buckley, because that girl came alive for me. Jeremiah's Hunger reveals a great deal about the Great Hunger/Famine and the politics of Ireland during an era which saw so many Irish gone abroad (to America) for survival. Unlike a purely historical accounting, however, the author uses what she's learned of her ancestors (from research) combined with a vivid imagination and knowledge of the Irish landscape to create a story of family and loyalty, and what it means to be Irish (at home and abroad). This was a warm and personal history / novel by a dear friend of mine and frequently we called her on the phone to ask how to pronounce a certain word, or even what it meant. Next publication would benefit from a glossary of Irish vernacular! It was educational as well an interesting and enjoyable read. I really liked this book- So much history in this family- this author is one I would love to share a cup of tea with! Historical facts told through a family saga worked well to illuminate the Irish story of land struggle and the unending quest for freedom that is still alive today. Elizabeth Osta is an author based in Rochester, New York. She has also been a frequent reader for the Writers and Books Genesee Reading Series. In addition to her published books, she also writes essays. Awards include the Democrat and Chronicle Golden Pen award, the Writers and Books Big Pencil Award, and Honorary Mention for Big Brick Review.